Illustrations by Bill Greer, under the direction of Lloyd Morgan. Measurements: 2.75 x 4.75 inches; or 70 x 120 millimeters. Back of card: Solid medium blue field with hand drawn white stars, five, six, seven points. Book included: Yes, 94 pages, 5.5 x 8.5 inches, 140 x 215 mm, illustrated: The Book of Tarot, by Susan Gerulskis-Estes. Also with the cards, a small booklet, 12 pages, 2.5 x 4.25 inches; or 120 x 180 millimeters. A long piece of paper folded up. Comments: Also includes a large sheet of paper with the Celtic layout marked out on it & what the different positions mean. The colors of many of the cards in this deck remind me of what happens when you shoot color film indoors without a filter or flash: Everything looks a gummy orange/yellow. Here the Magician is an Arab sheik, which, given the colors of the clothing only serves to remind us that Jesus was born in the Mid-East. In the book, it says he's Hermes, the messenger of the Gods. This seems a common misunderstanding of Hermes/Mercury with Hermes/Toth but we feel we may be boring our browsers. On the box it says the artist used strong colors to create an immediate emotional reaction to each card. Since the results remind us of bad photography, we must have flunked the test! 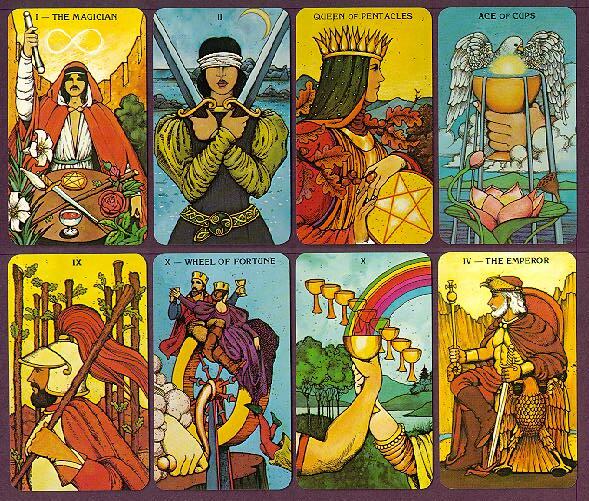 Some of the cards remind us of the Rider Waite deck, only close up.